The City of Colleyville, Texas required annual customer service inspection for cross connection control so that the Colleyville water supply will remain pollutant-free from the effects of backflow. 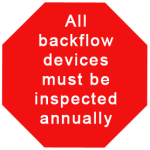 Attend backflow certification courses approved by the City of Colleyville. Every backflow tester must be certified as a backflow tester and show evidence that he/she is insured and bonded to perform backflow services on backflow preventer valves and back flow devices, and all licenses with the State of Texas are current. City Backflow Testing tests, maintains and repair all back flow devices in Colleyville, Texas.